#WeAmaze – Week 3 Winner! Hello everyone! I’m a little late announcing this week’s winner, but it has been busy with summer activities around the West End. This week, Rachael Leigh (@rachaelleighxo) has won the prize for her capture of a West End restaurant signage that truly sums up the best of summer. Although our skies were full of smoke and haze last week, there truly is nowhere better to enjoy some take out and beach time than in the West End. English Bay is one of the most popular spots in the city for locals and visitors alike, whether for an afternoon of swimming or an evening of fireworks. Thanks for sharing this fun summer photo Rachael Leigh! 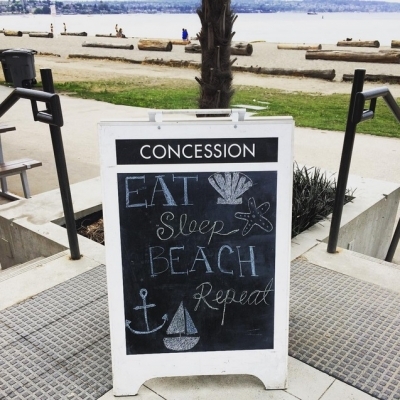 Rachael Leigh has won a gift certificate for two (2) half-day bicycle rentals from English Bay Bikes and two (2) VIP seats for Fresh Air Cinema‘s showing of Grease in Stanley Park, thanks to contest partner Intracorp and The Jervis. Additionally, Rachael Leigh is now in the running for the chance to win the grand prize of a new Electra Loft bicycle from Denman Bike Shop at the end of the summer.